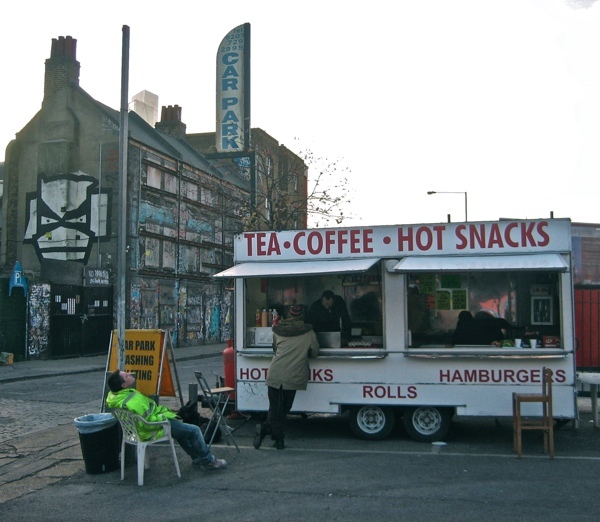 At the junction of Sclater St and Cygnet St, on the corner of the car park, sits Paul’s Tea Stall selling a modest range of beverages and hot snacks at keen prices. 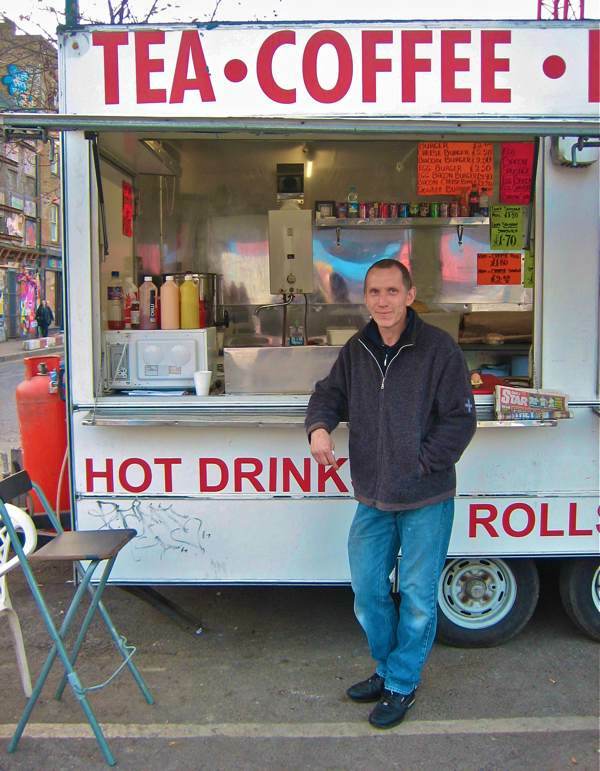 A cherished haven for anyone who would rather pay 80p than the two pounds charged for a cup of tea in some of the fancy coffee shops – Paul Featherstone’s burger van has become a Spitalfields institution in just three years . For those who do not have the time or spare cash to go into a cafe, and for those who prefer to take their refreshment en plein air, it is the centre of the world. As the November dusk falls in the mid-afternoon, the spill of illumination from Paul’s Tea Stall casts a glowing pool of light into the chill of the gathering gloom, as if to manifest the warmth of this friendly harbour in the midst of the urban landscape. 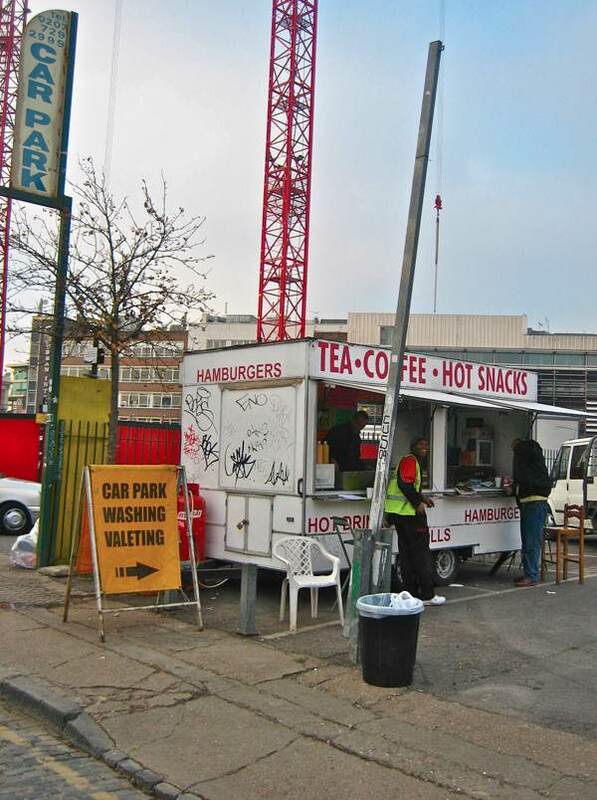 If you have been working on one of the surrounding construction sites since dawn, this is where you escape to get your cup of tea and bacon sandwich. If you are cab driver or a courier, driving around London all day, you can turn up and Paul will greet you by name, like a long lost friend. If you seek company and you have little money and nowhere else to go, you will be welcome here. Even if you are a peckish schoolboy that skipped the duff school lunch, you can drop by for a sausage sandwich on the way home. All of these I witnessed yesterday – when I joined the regulars at Paul’s Tea Stall for a couple of hours, perched on a stool and clutching a hot cup of tea to warm me in the cold, while enjoying the constant theatre of customers coming and going and sharing their stories. Always buoyant, Paul welcomes every one of his customers individually, fulfilling the role of host with conscientious good spirits. 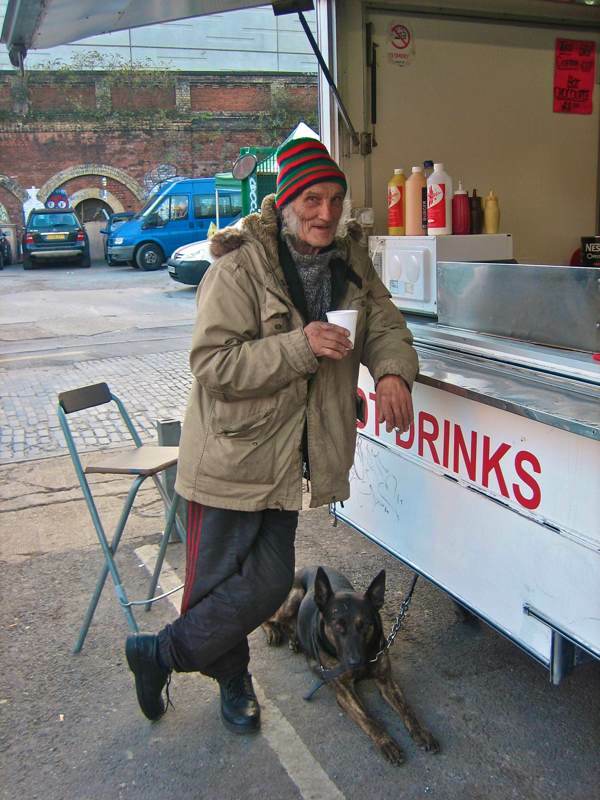 With everybody leaning against the counter, sipping their drinks, and swapping genial banter and backchat along the line, the atmosphere is more like that of a pub than a cafe – and I was delighted to meet my old friend Tom the Sailor who is here every day with his dog Matty. And somehow, in the few quiet moments, Paul managed to fit in telling me his story too. 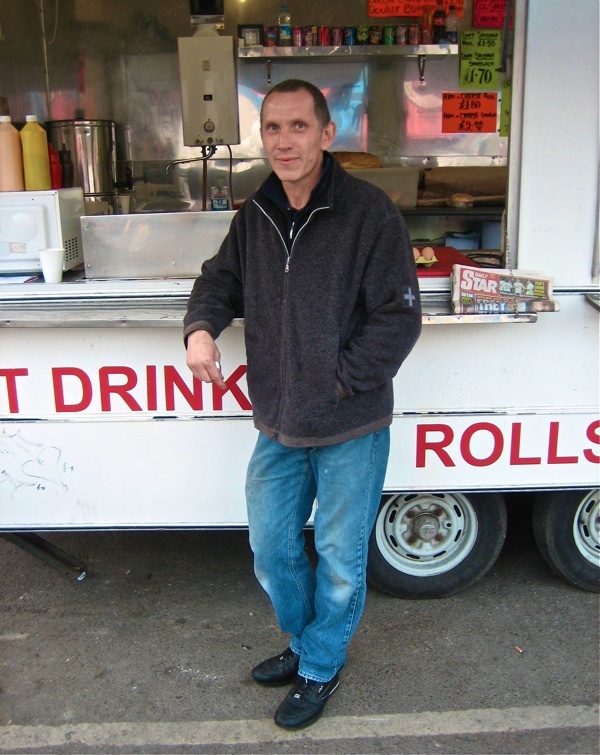 “I used to have a fruit & veg stall outside Staple Inn in High Holborn, I was there fifteen years from 1988. But I was brought up in a cafe in Harrow, even as a child I worked there for my pocket money – so I thought, I’ll open a cafe. With the fruit & veg, it’s passing trade, you never get to speak much but here people stay and talk. You’ve got the community. You meet people like Tom – there’s plenty round here. I’ve been on the phone for them sorting out their pension and electricity. Someone needs to take care of them. My dad was a compulsive gambler and, while he was round the betting shop gambling our money away, my mother and I used to be feeding and taking care of all the waifs and strays in the cafe. I do the same here, when people come and say they have no money, I feed them up. I haven’t had a day off in three years or a holiday in five years. Saturday is the only day I am not here and I like to spend it in bed, catching up on my kip, but my wife tries to get me to do the gardening. I leave home in Southend each morning before six to get here before eight and open up, then I leave again at six and get home around seven thirty or eight, depending on traffic. It does feel like all work and no play, but I’d rather be doing this than working for someone else. And it’s interesting here, you never know who’s going to turn up next. I like to chat with all my customers, many are friends now and I know all their names. I’ve never fallen out with anybody. The tall red cranes towering over Paul’s Tea Stall and promising future custom, are also harbingers of the time when his presence may no longer be welcome. Yet Paul takes it in his stride, he has seen the East End change before – on leaving school at eighteen he became a van driver for a company supplying lining fabrics to the clothing factories that are now gone – so, for the time being at least, Tom and Matty are a regular fixture at Paul’s Tea Stall each morning in Sclater St.
Another great series of portraits! Thank you! These are the real heroes! There is not much a cup of tea won’t help! 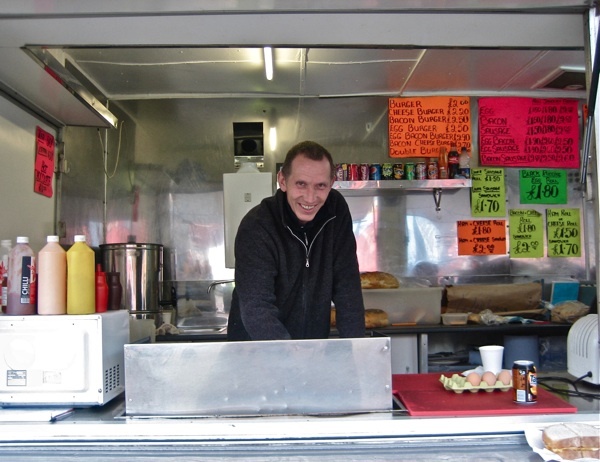 I love the slogan ‘The Future of British Cuisine’ next to the photo of Paul and his stall. 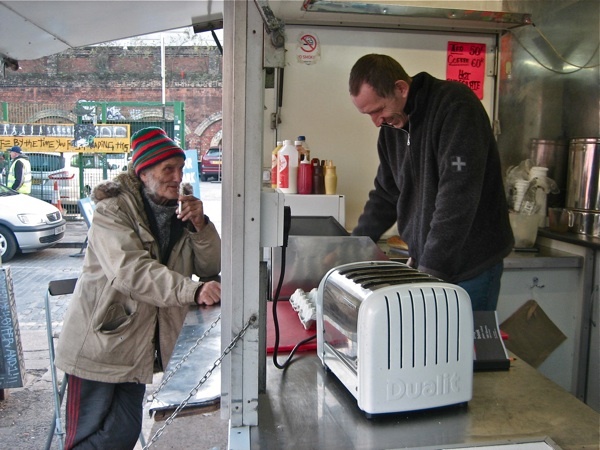 Synchronicity at work – the best bacon sandwich in London is to be found at Paul’s stall. glad to see my friend matty is truckin’ on. When you lose your way in life sometimes a kind soul to talk to and a hot cuppa can help get you back on track. Where would London be without nice people like Paul?